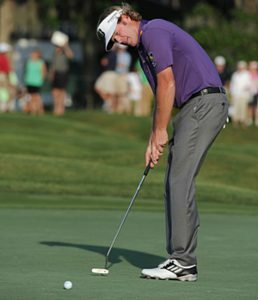 Great putters like Brandt Snedeker get their eyes right over the ball at address. Every putter manufacturer stresses the importance of FEEL. Words like “soft feel,” “muted feel,” “firm feel,” “softer sound and feel,” “old school feel,” and “gentle feel” are used to describe the feel of the putter’s impact with the golf ball. All golfers know and understand that sensation, both the good and the bad. Impacting the ball at or near the putter’s sweet spot feels good. A GolfWorks study1 by Britt Lindsey confirmed that virtually all tour professionals and low handicap players are the best sweet spot hitting golfers. What is a sweet spot? The sweet spot is that the small area on the striking surface of a golf club that must contact the ball if maximum power and control are to be attained. (Collins English Dictionary). When putting, to hit the sweet spot, the golfer must align the center of the golf ball with the centerline of the putter. Almost every putter has a black or white line on the top of the putter to help aim and align the putter’s sweet spot with the golf ball. As an observer, from a distance, it is easy to see when other golfers have or have not aligned the ball and putter sweet spot. Surprisingly, when you check out the teaching pros on YouTube or watching your friends putt, you will discover that almost everyone fails to really align the golf ball’s centerline and putter’s sweet spot. Why? Aligning a ball and putter should be easy - not really! A technical phenomenon, a Parallax Effect, visually misleads the golfer into believing that the centerline of the golf ball is aligned with the center line of the putter. To understand the Parallax Effect, let’s take a step by step analysis of the putter aiming and alignment process. With the ball on the green, the golfer tries to visualize the probable trajectory of the putt. After making the read, the golfer usually picks an intermediate point along the anticipated line to aim the putt. Next, the golfer addresses the golf ball. Looking down on the golf ball, the golfer envisions the ball’s centerline. If the golfer looks direct down on the golf ball, the golfer will visualize the true centerline of the ball. However, if the golfer does not look directly down at the golf ball, they will experience geodesic distortion skew2 – in plain English, the perceived ball’s centerline is shifting slightly closer to the golfer. The perceived centerline shift is about 0.010 inches for every degree the sight line is off of vertical. For example, if the line of sight is 86°, rather than 90°, the perceived ball centerline is 0.040 inches closer to the golfer. After visualizing the golf ball’s centerline, the golfer positions the putter behind the golf ball. If the golfer aligns the putter’s centerline with the perceived ball centerline, the putter’s true sweet spot will be slightly misaligned with the real center of the golf ball. The slight misalignment, between the golf ball and the putter’s sweet spot, will adversely affect the putt’s distance and accuracy. The greater the misalignment error, the higher the probability that you will need more putts to complete your round of golf. If you want to ‘aim to make’ like the pros, you will need to adjust your putt process for the Parallax Effect. Hitting the golf ball consistently with the putter’s sweet spot will “feel” great and assure you will make more putts.